If you want to make a standing impression anywhere in your life, whether it is in front of your friends, your family, or in this case, your hiring manager, you have to first be able to understand your audience. Put yourself in the shoes of your recruiter, and ask yourself, what you would like to see in a potential candidate. Now use this information in designing yourself an attractive CV! Now, while you might spend hours tweaking and making changes to your resume, you must also keep in mind that your hiring manager probably has to look at dozens or even hundreds of CV’s every day. In fact, on an average, a recruiter will spend no more than 6 seconds looking at a CV! So now that you know you have 6 seconds to make a lasting impression. The following mentioned are few resume advice and tips on how to make your resume stand out and making a attractive resume format. Now here is a very important psychological trick which most people don’t know. The ‘CV hotspot’ is known as the place where the eye immediately goes when we see a CV or professional resume. This ‘hotspot’ is located in the upper middle portion of the CV. Make sure you lay out all your most relevant information in this hotspot, so it most definitely catches the recruiter’s eye. This is because many recruiters and hiring managers do not have the luxury of time to read through all the resumes thoroughly. So having a ‘hotspot’ in CVs and resumes is a game changer for most candidates. Over all, keep a very simple effective resume layout. This will make your CV look neat, and appeasing to the eye. Cramming up the CV with too much information will just give an impression of being unorganised or untidy, so keep it clean! Also make sure that your CV should not be more than two pages. 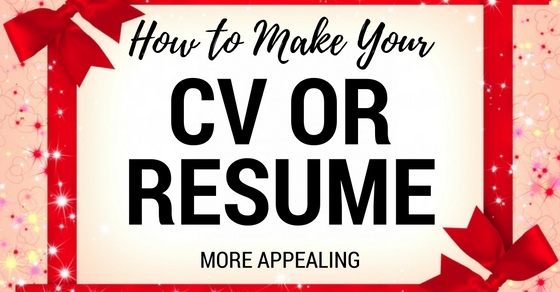 In order to attract your hiring recruiters, there is no need for you to go all out on your CV and start adding all sorts of different fonts and colours to your CV. Too much of something can be a little hard to digest, after all. Keep a simple resume font size, which is easy to read, pleasing to the eye, and doesn’t clutter up the CV. The most popular fonts which most people go with when designing CVs are Times New Roman, Georgia, and Tahoma. These fonts look great both on screen as well as on paper. You want to make sure the font you chose can be read easily, as it will be instantly rejected otherwise. You must realize there is a subtle difference between hard skills and soft skills. Don’t be afraid to go that extra mile and add it in your CV. For example, under Hard Skills, you may write “Fluent in English, French and German. Inversely, you may add “Communication skills” under soft skills. They need to persuade the recruiter why you are different from the rest of the candidates through your CV. Try to sell your skills and abilities through your resume and make them believe that you are the best choice for the job. To define what your skills and abilities are, try to add your achievements and success that you have experienced in your professional life. These can include, the time when you lead a team successfully, when you completed a work within the given deadline, the time when you worked hard to increase the sales of your company and so on. This is to give an impression that you are determined to be a valuable employee of the company. As mentioned earlier, if you want to impress, you must know your audience. It might take a little extra time and effort, but you must tailor your CV to the post you are applying for. This will show that you have added that extra effort and extra effort will get you an extra point, when you are trying to snag that job offer. One of the most common rookie mistakes that many first time candidates do is that, they send the same resume and CV to variety of job positions and openings without updating them according to the position. This is a big mistake that can even make your resume eliminated during the selection process. Try to edit your resume and prepare a tailored resume according to the job positions and make your skills and abilities relevant to the job description. This increases your chances of being selected for the job. While you might feel a little ambitious in showing off your skills, do not add irrelevant information to your CV. It will be seen as a disadvantage, as your hiring managers will not even have the time to go through all the points. Add only that information which is necessary and relevant to your job. Also, adding a large amount of irrelevant information increases the length of the resume. Try to make resume short and crisp with just the correct amount of information required for the job application. The rest of the information will be asked to you during the interview process. This might be one of the most obvious and overlooked points, but remember to always keep your CV up to date. Any recent activities (which may be pertaining to your job), recent winnings, awards, personal experiences, activities, skills and courses, add them to your CV. This will not only expand your skill base, but will also give the impression of you being into activities outside your workplace. Always try to show your recruiters and managers how you are constantly growing and developing professionally as well as personally. This will only come as an advantage to your overall impressionable skills. No matter how much time you spend decorating and designing your CV, unless you have information inside the CV to back you up, it will just look like you want to show off on your designing skills and lack any real skills. Plan out the information you want to lay out in your CV, make a rough format, and then go around to making the CV design. It is always easier to work around the information already laid out in a proper format. Spend 80% of your time planning on what pertinent information you want to put in your CV. The designing should just take about 20% of your time. Remember, you need substance to go with the resume style, so make sure you list down all your skills and achievements beforehand, so that you don’t miss out on any important information during the designing stage. Many of us aren’t the inborn designers that our friends might be, so if you don’t have the time to spend time formatting, the best way to make sure your CV is eye catching, is to use a beautiful CV template. There are many options of inbuilt templates that you can sift through to choose the one that is most appealing to you. Microsoft word will offer you a number of decent looking templates to choose from. On the other hand, if you are particularly creative, don’t be shy, and design a template on your own. Be sure to follow a few guidelines though, as at the end of the day, it is a professional looking CV that you want to be presenting. You may use colours and fonts, but don’t go too crazy with them. Keep them to soft colours and easy, readable fonts. You might think of highlighting a few lines here and there, but once again, remember to keep a subtlety and softness in designing your CV. Your contact information and name should be right at the top of your CV, in bold; to catch the attention of whomever is reading it. This is extremely important, as it should stand out to make a good impression and provide credibility for you. Also, while adding your contact information make sure that you have included your contact number and your professional email address. If possible, try to add your LinkedIn profile details so that you can get a chance to interact with them through professional social media. One thing we tend to forget, is that all our CVs are first viewed by our hiring managers on a computer screen, and then on paper. Information tends to look slightly different on screen than it does on paper. More often than not, a hiring manager or recruiter will not go through each and every word of your CV. They tend to scan their eyes and skim over the words. If any particular thing catches their eye, they read it and again move forward. You include only important, pertinent information in these points. Quantify the points as much as possible. Use clear, bold headings. Make your headings stand out from the rest of your CV so that he/she can choose which points are relevant for them to read. Keep the points short and concise. Crisp, to the point information will be more accepted than block points. Make sure the headings have some white space around them. Cramped up headings will not be pleasing to the eye or the mind. A very important but highly forgotten issue is the quality of paper on which candidates choose to print out their CVs. Your CV is not the place where you want to show how economic you are. Use good quality, A4 size sheets to print out your CV. This will also create a good impression that you are concerned about your presentation on paper, literally! Unless you are applying a resume for job which requires you to show off your face for a living, such as an acting or modelling career, it is not necessary to add a picture of yourself to your CV. You want to make sure you are being hired for your skills, not your looks. So unless it is specified, avoid attaching a picture of yourself to your CV. Any other images added to your CV to make it look more vibrant or appealing should also be avoided. You want to make sure your CV looks as professional as possible, but also approachable. This is a mistake made by one and many. Be it fatigue after spending hours designing your CV, over excitement and excessive enthusiasm to finally get that perfect CV out, or simply impulsiveness, many of us fail to proof read our CVs before sending them out or printing them out. It is just human behaviour that one might make minor errors, be it in spelling or grammar. You can land yourself in very embarrassing situations if you do not proof read your CV. Even one proof reading of your CV might reveal small mistakes which you might not have thought you could make. Always try to proofread your resume at least a couple of times to find small mistakes and errors. If you feel that you are too tired to proofread, ask your friend to proofread it for you and make sure that you ask for their opinions about the completed resume. These are just some of the few simple resume tips and tricks you can try, if you want to make a resume or CV look more appealing to your recruiters. The most important thing to remember while resume making is to be you. Do not showcase more than what you are, but on the other hand, never under play yourself either.